Mirrors are simultaneously both practical and beautiful. Need to brighten up a room? 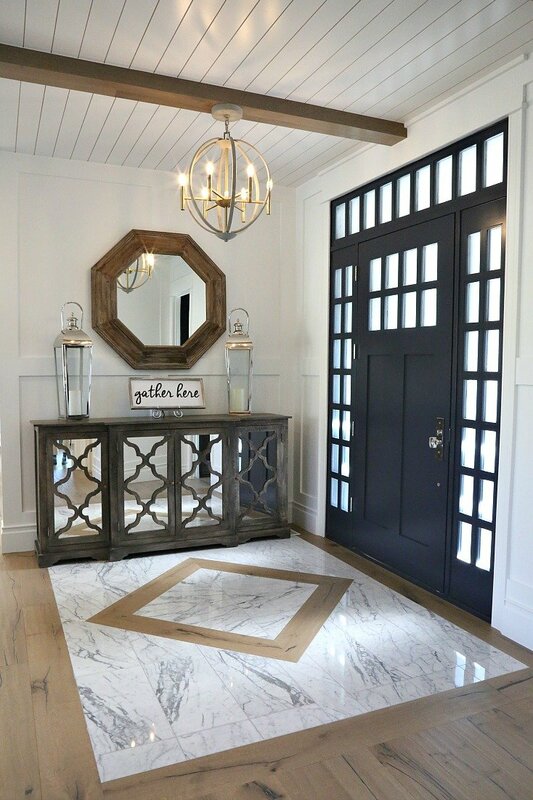 A well-placed mirror can help fill it with light. 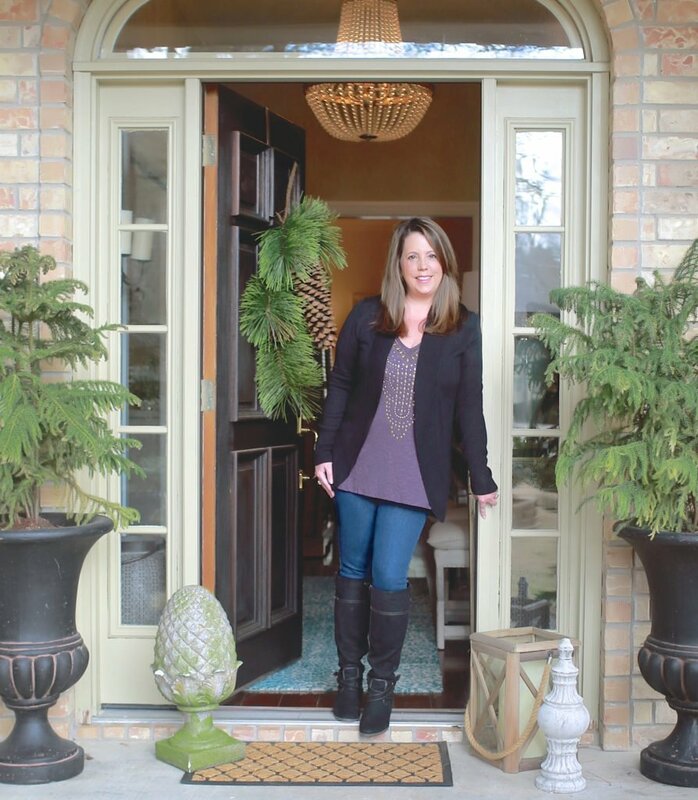 Want to create a focal point or make a smaller space seem larger? Mirrors. If you follow Feng Shui, proper mirror placement is key component of the practice. 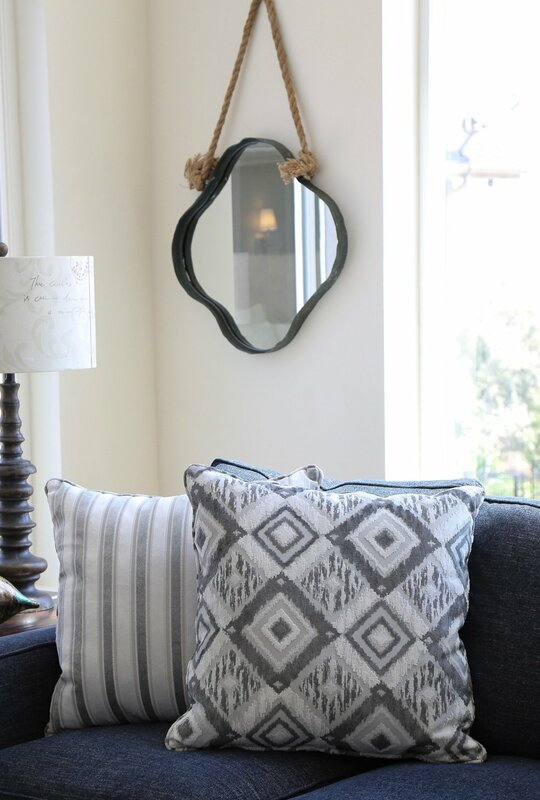 Today, we’re sharing some creative mirror design tricks that can brighten up a room and create a beautiful focal point on your walls. There is a mirror in almost every room in my house. In the the dining room it is placed to bring more light into the space. In the living room, the antique mirror is more art over function. And the one near the front door is at the right height so anyone can do a vanity check before dashing out the door. 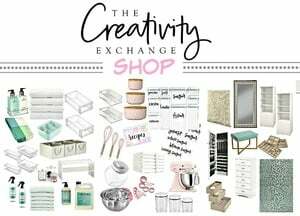 They can be a relatively inexpensive way to add a pop of light into your home decor or you can go wild with all the wonderful designs available. 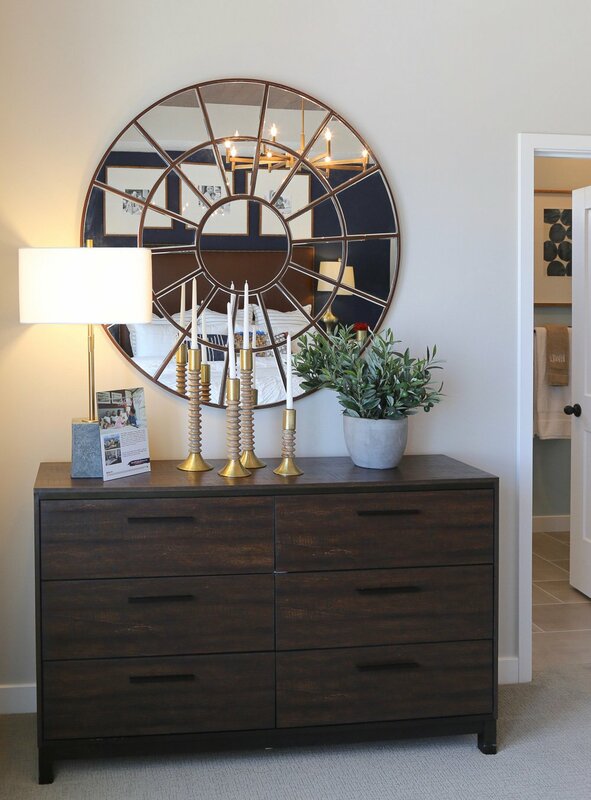 We found inspiration in the Parade of Homes tours where mirrors were an integral part of the decor. I hope you find inspiration, too. 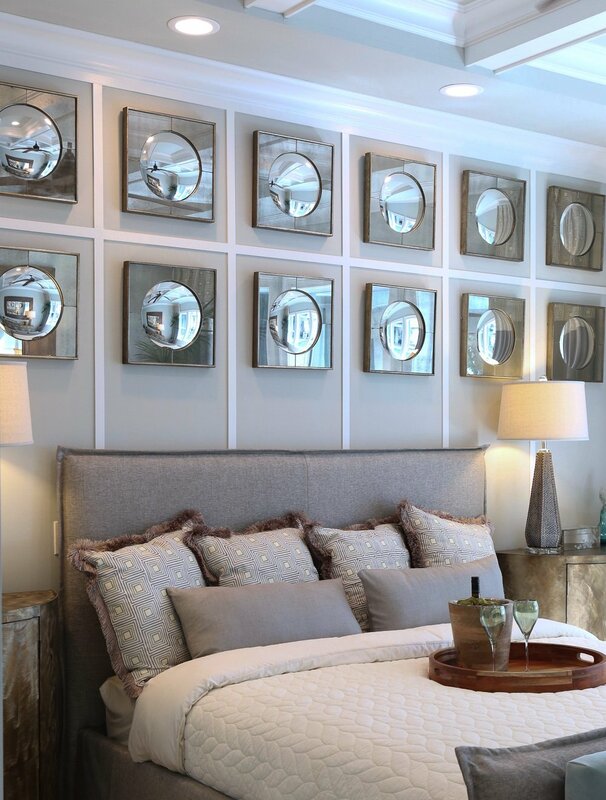 Grouping mirrors, whether two or more create a beautiful focal point on a wall and can help to brighten up a space. These beaded silver frames make a statement without going over the top. 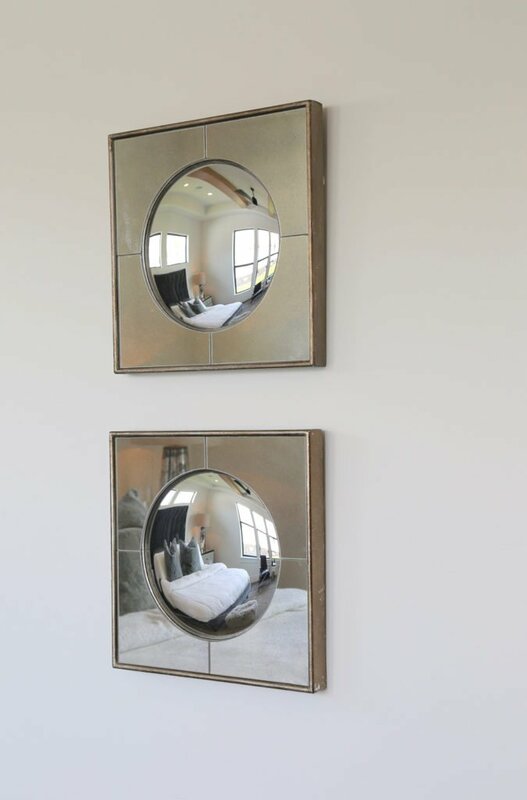 I found similar mirrors on Wayfair. Wow. I love the statement this group of mirrors makes below. The crown molding gives it an old fashioned appeal matched to the modern grouping. It is like looking into three windows. Restoration Hardware has the perfect match. 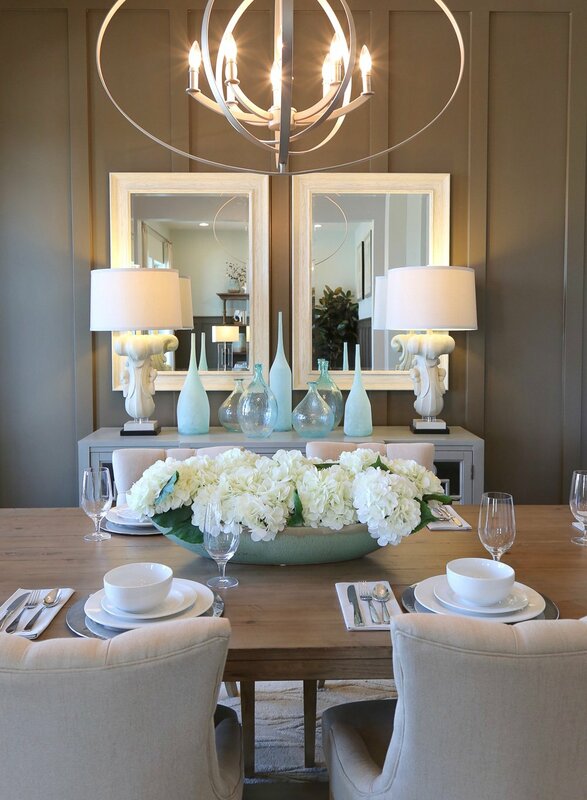 Instead of one very large mirror, two mirrors not only bring the impact but provide a nice balance over the buffet. I took inspiration from this dining room decor above and found a lovely bone inlay mirror on WestElm. 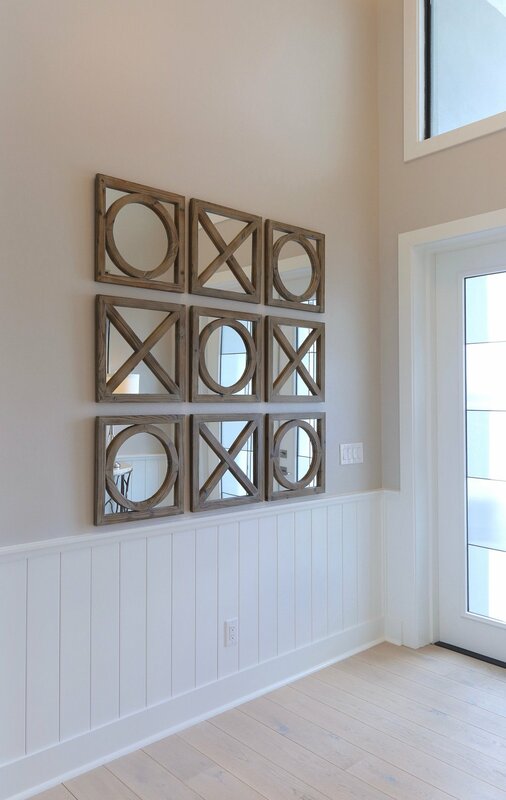 These x’s and o’s square mirrors below grouped together really make a beautiful statement. 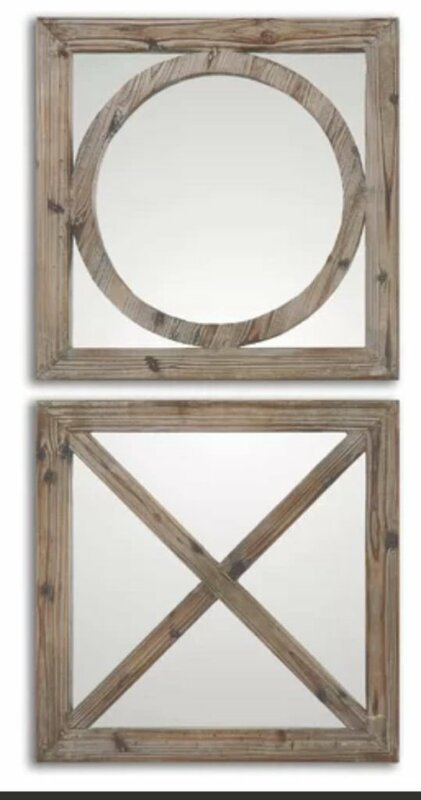 We found the exact same x and o mirrors on Wayfair here. 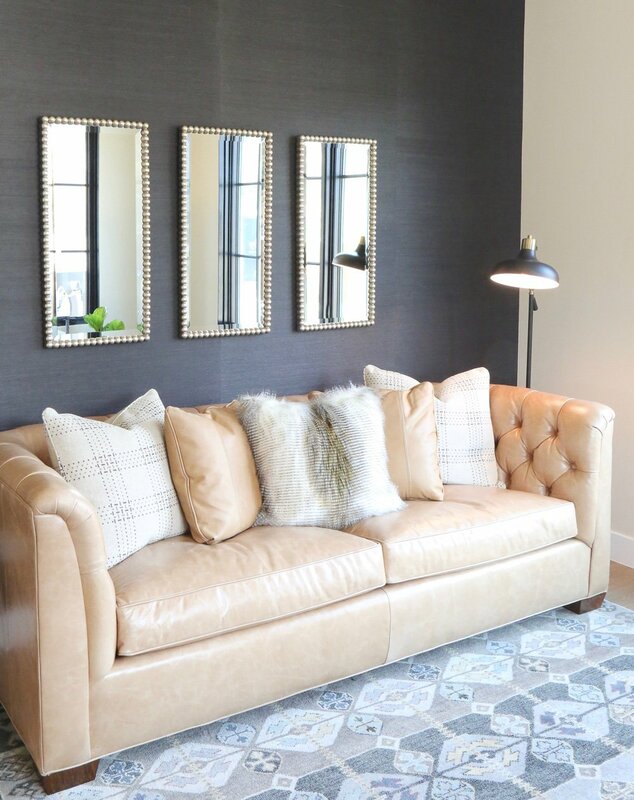 The mirrors below are the perfect wall decor. A tad industrial. Not too shiny. 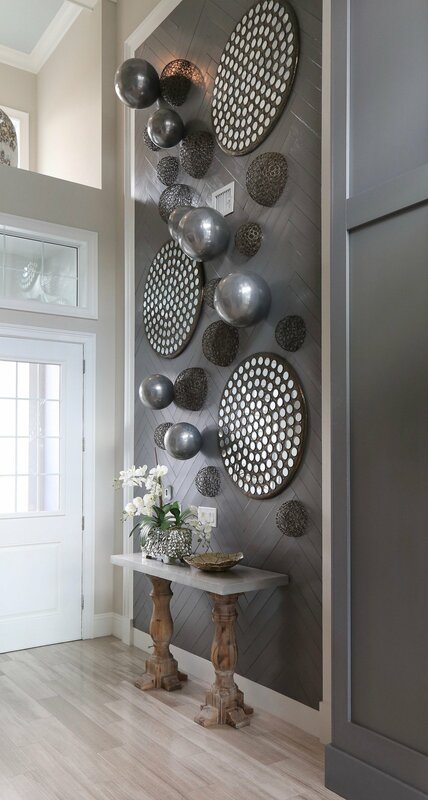 The convex pair times six creates a wall decor statement. 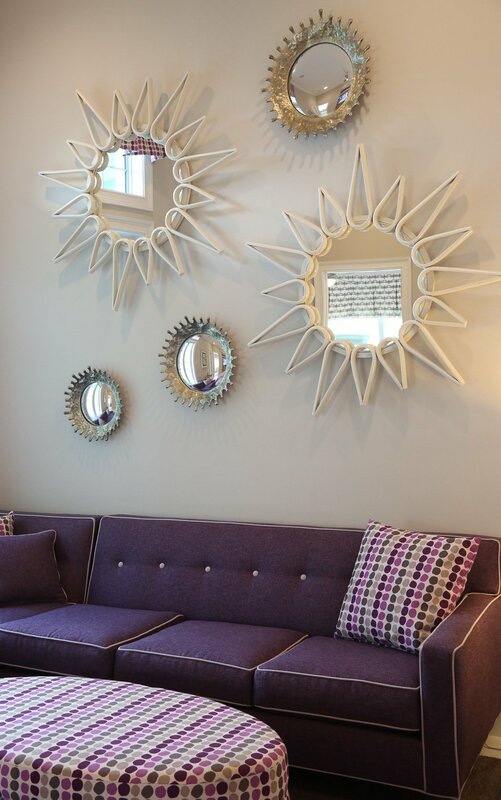 A cluster of sunburst mirrors add a dash of whimsy to a wall. Sun and light go together. 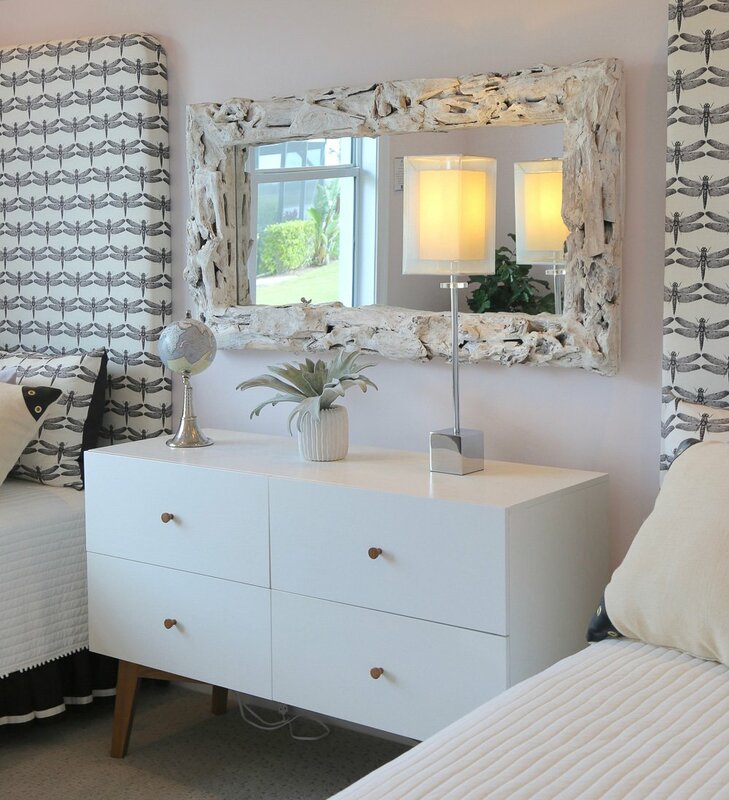 Love the Selamat Ray round mirror which has brings a fresh retro look to starburst mirrors. Three mosaic mirrors above add panache without too much reflection. We found a similar mosaic decor mirror. Quick thought. Glass mirrors can be quite heavy. One way is to group mirrors to share the weight. Another is to use mirrored acrylic to give the same impact without the added weight plus acrylic in non-breakable which is a safety consideration. The continuity of a circle is what makes round and oval mirrors so pleasing to the eye. 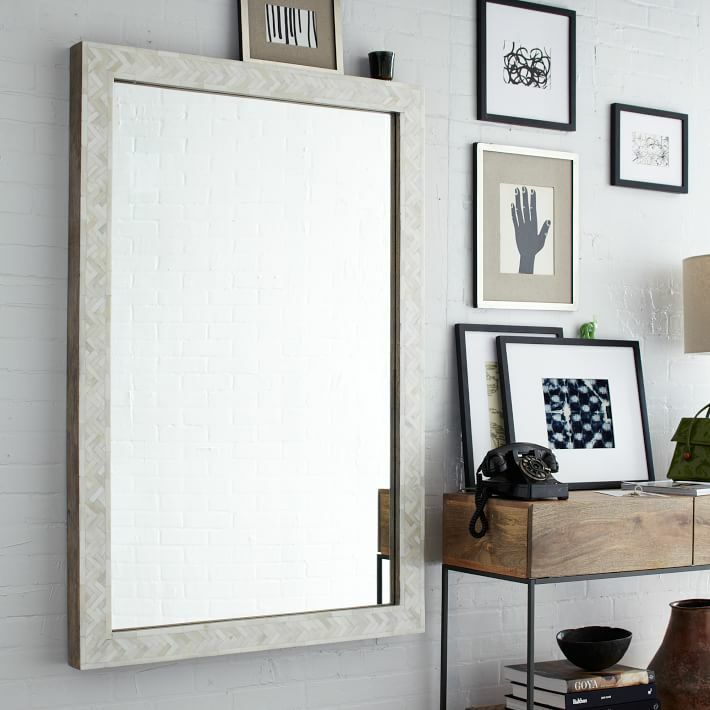 This Pottery Barn iron and glass mirror makes a big impact. I love how it looks like a round window. Depending on your decor, you could play up the more industrial look of the iron, or not. I love the airy look of this mirror below. 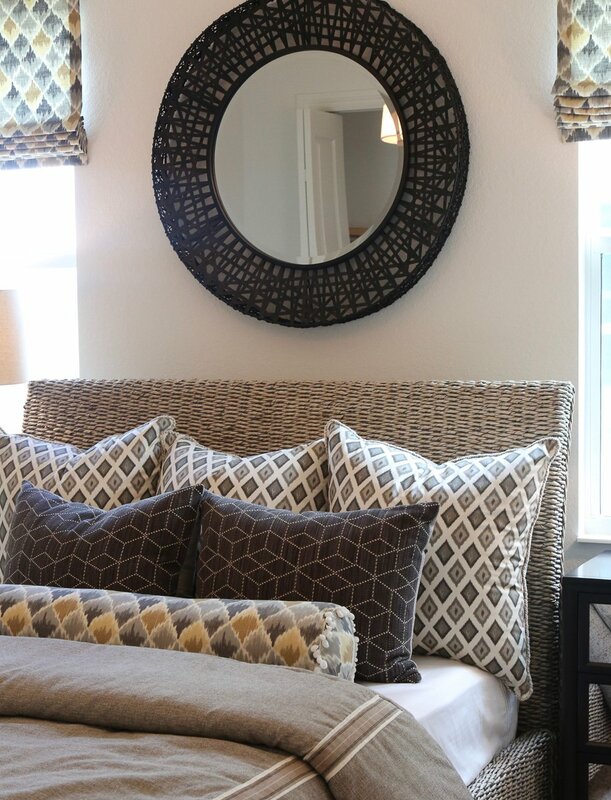 Take the retro inspiration and try a wicker mirror to get a similar look. We love this beautiful statement petal mirror. The flower design with antique silver frame petals is lovely. 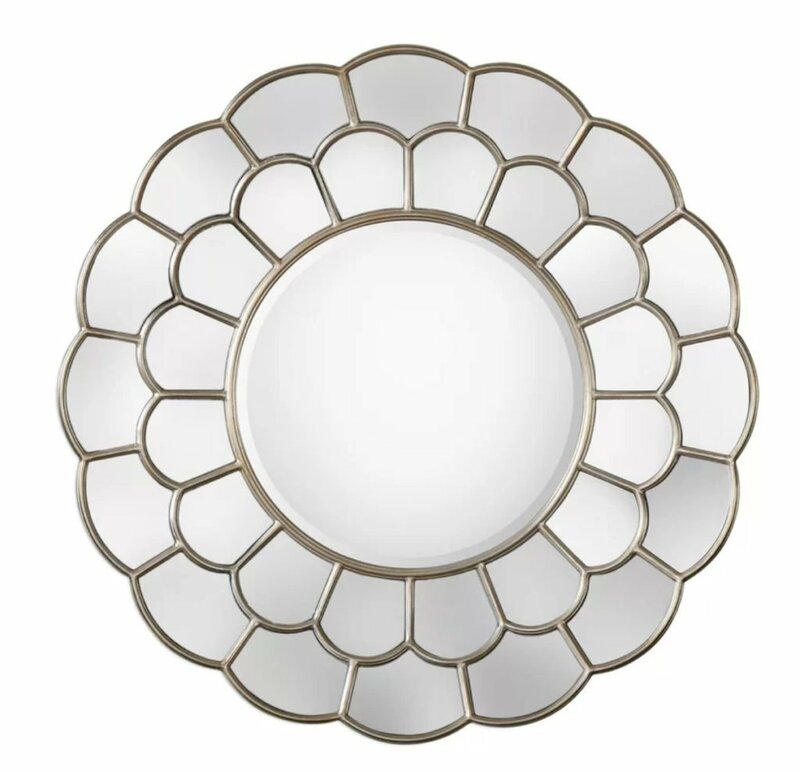 Found the petal mirror on Wayfair. A round scalloped mirror provides the fluidity of the circle shape but the scalloping breaks up the harshness of the the line. 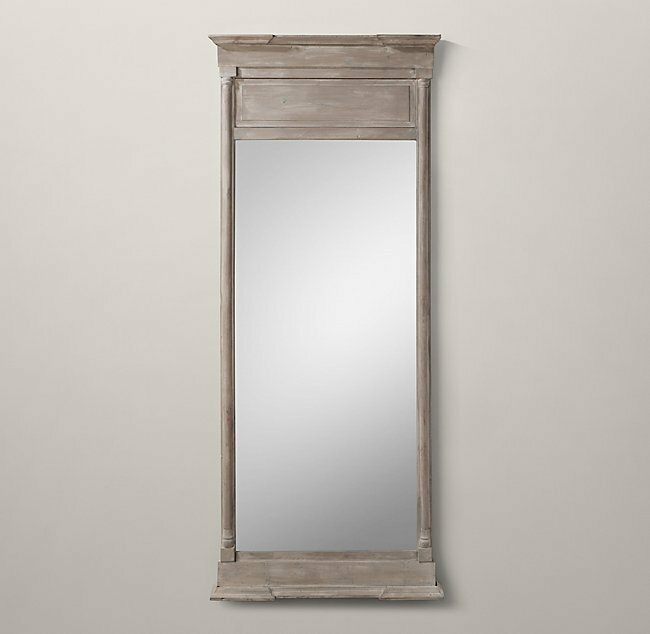 Below is a very popular style of mirror. Keeping with the flow of a circle meeting the look of a window. This tyoe of large mirror is great to brighten up darker areas in the home. We found the exact mirror on Hayneedle. 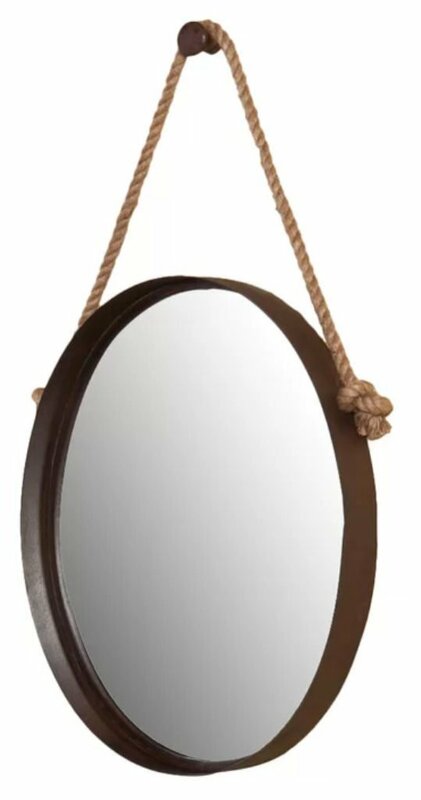 A rope mirror can give a chic coastal touch into any room. 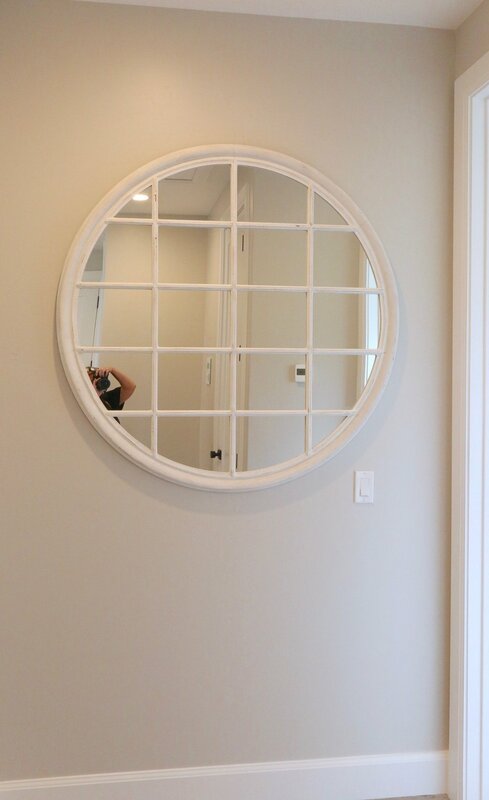 Birch Lane has a round rope mirror that delivers charm and a focal point for the wall. 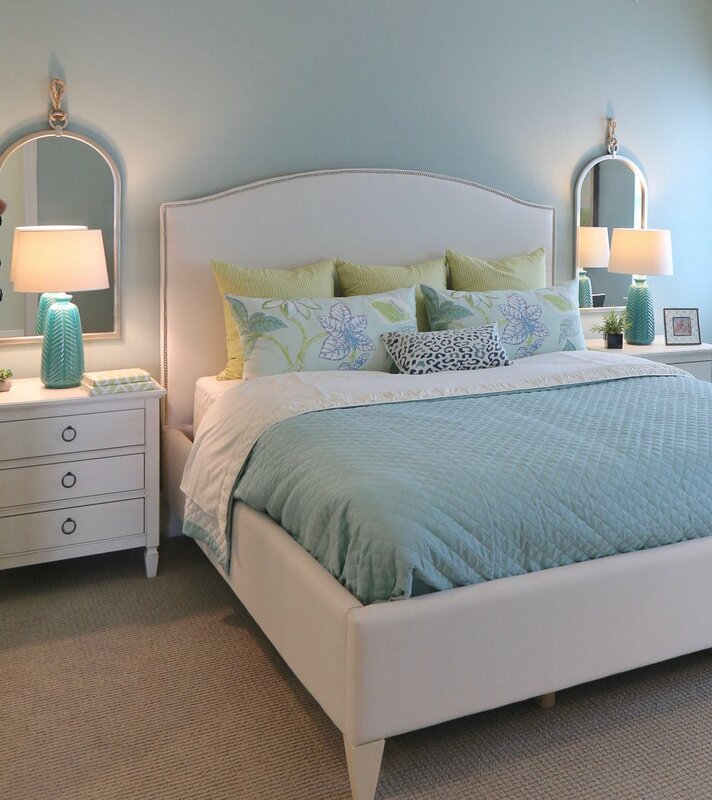 This adorable teen bedroom was on the Naples Florida Parade of Homes tour. What better than a driftwood mirror to bring a bit of the seaside, inside. The diamond window panel design is a great way to balance a bedroom and add drama to a wall. It also brings more light into the room as well as balance. 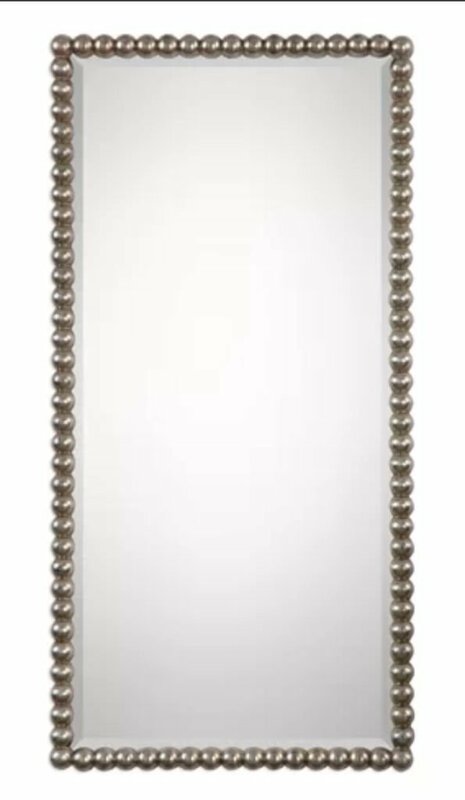 You can find these panel mirror at Kirklands. 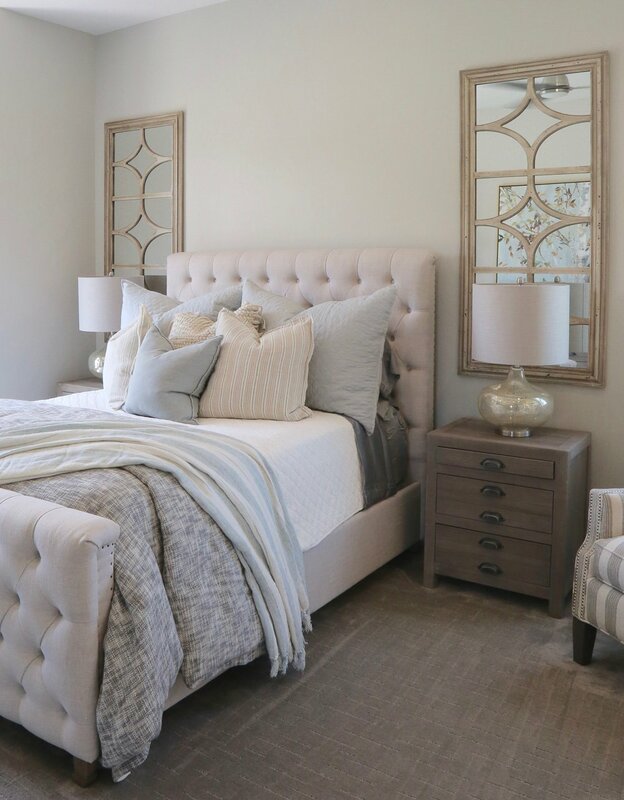 Another beautiful option for bedroom mirrors is to consider a pair of arched mirrors to make a beautiful statement and brighten up a space. Notice how the mirrors below behind the light help bounce light in the space. We found a similar mirror here. 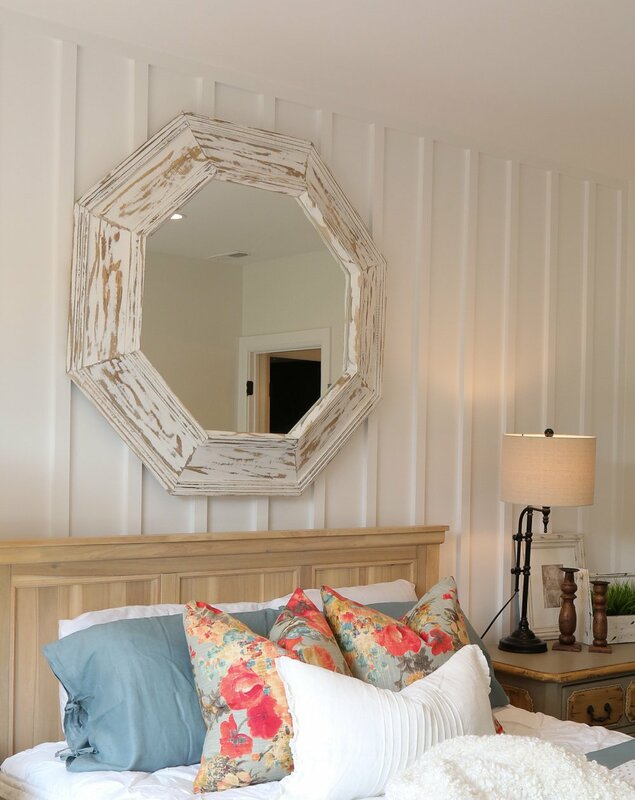 If you want to make a bold statement over your bed, consider a large octagonal shape. 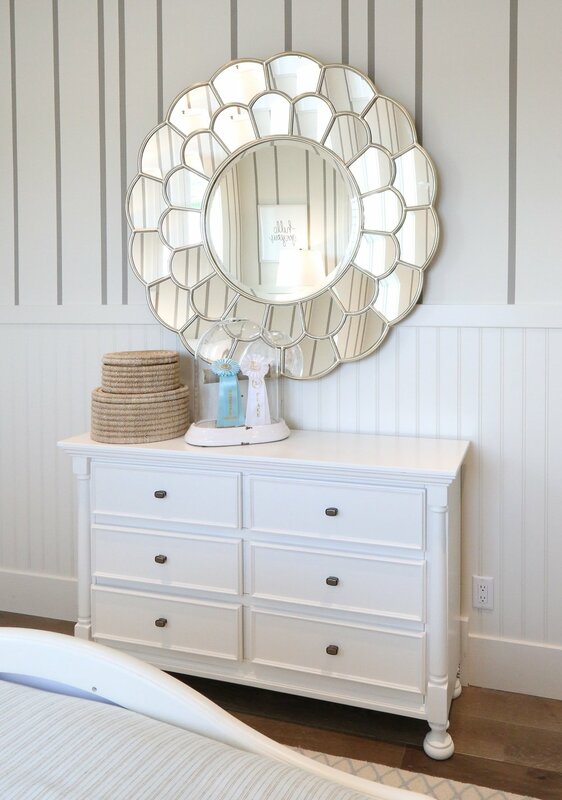 A classic shape, octagonal mirrors work in most rooms and decors. 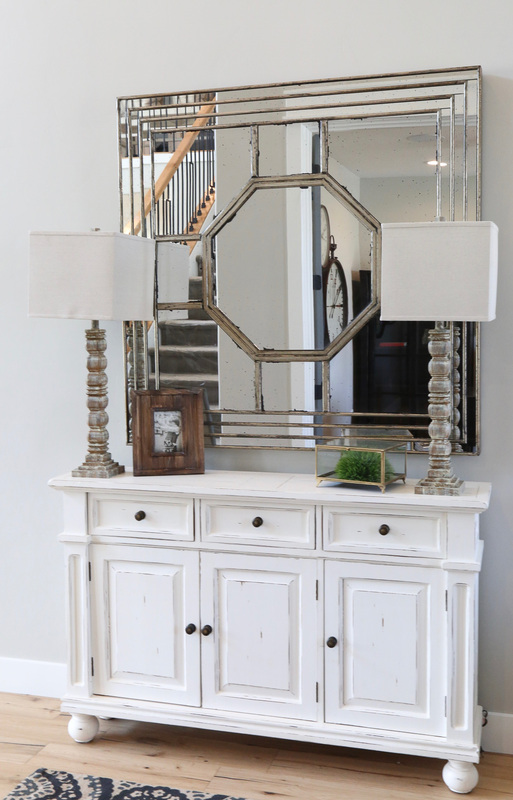 As here, with a similar look and weight perfect above a mirrored buffet console by Lowery. 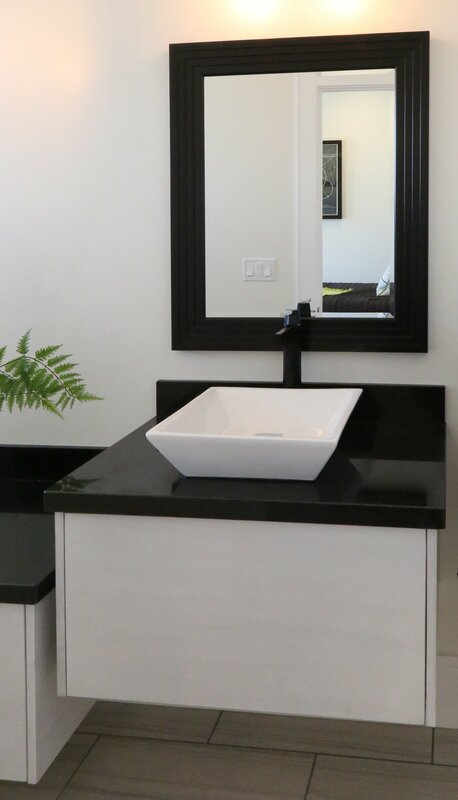 A black square wall mirror is a classic, elegant choice for a bathroom mirror. 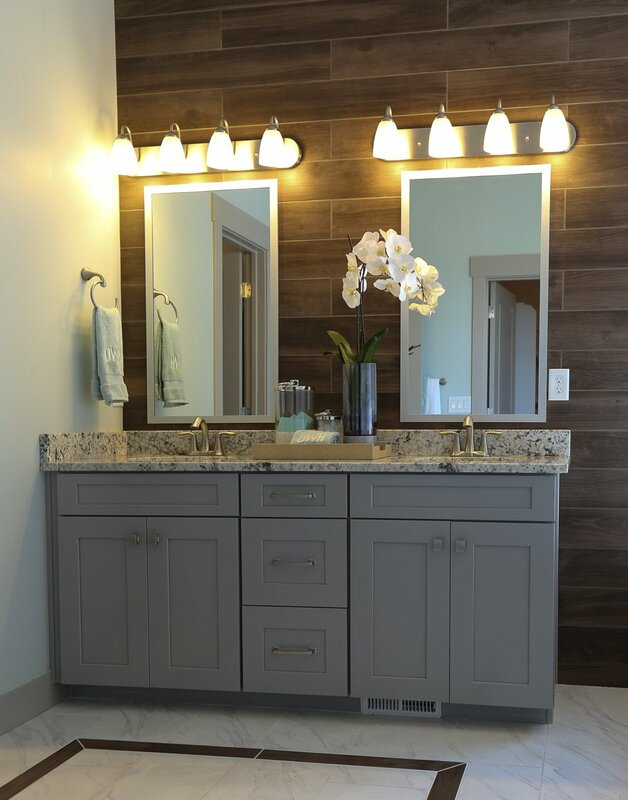 Nickel framed mirrors below bring a clean, modern look to any bathroom. Pottery Barn has a style that is a close match. A twig frame brings an organic look to the silver frame. 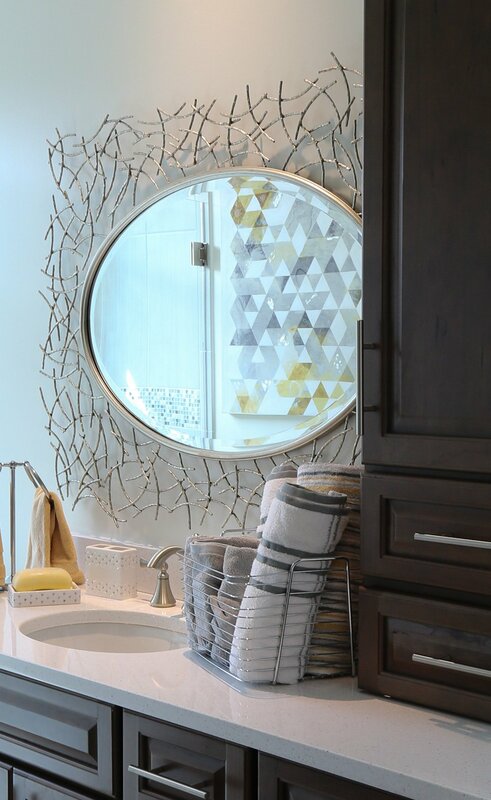 For such a statement mirror, it was an inspired choice to put in the bathroom. Here is a similar mirror. 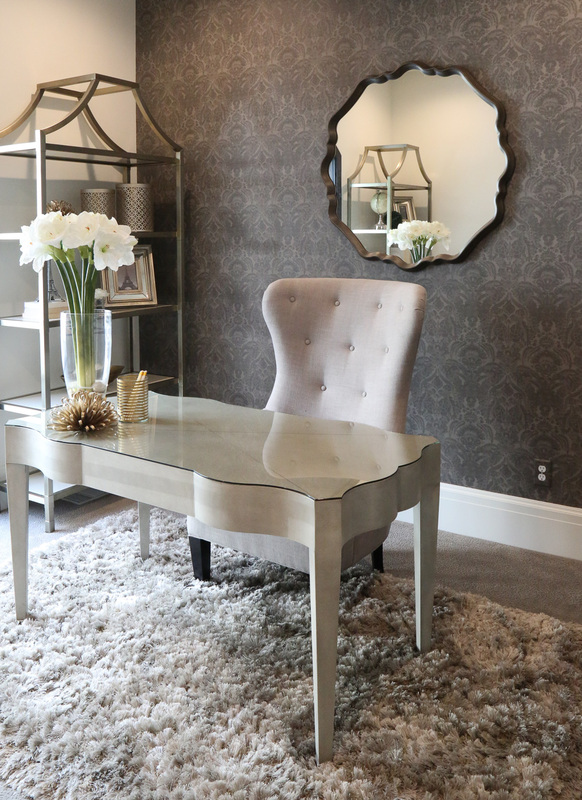 A beveled framed mirror gives a glamorous touch to any room. 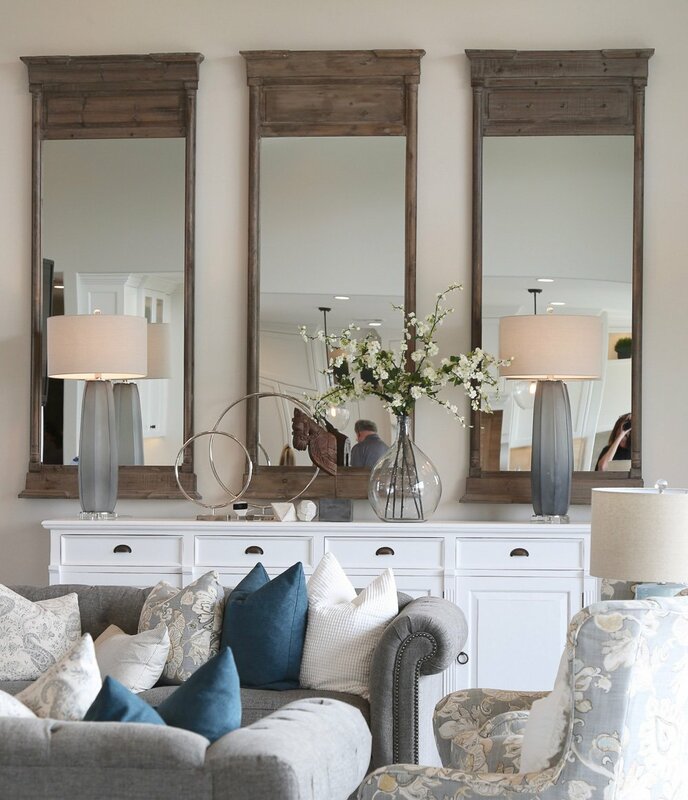 Now that we have you thinking about mirrors and how they can enhance the design and lighting in a space, checkout Cyndy’s posts on getting creative with large mirrors. Remember, mirrors, like art, can be moved to express your new mood, whim, or expression. Have fun finding new ways to reflect (pun intended) your vision. How many mirrors can you place in a room without it looking overdone? Lovely article – but I don’t see the sources for the inspiration pictures? Thank you, I see the links for the mirrors but I don’t see the sources for the inspiration pictures themselves? I am particularly interested in the source of the picture with the beveled mirror in it, not the actual mirror. Thank you so much. Love all the mirrors even though some were a little pricey.